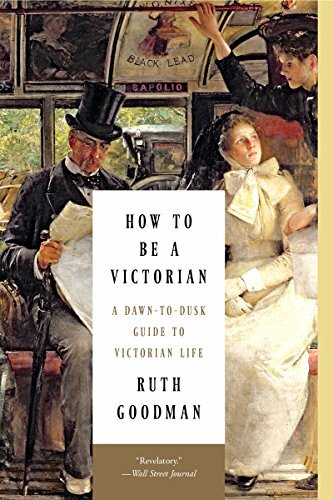 I’ve just finished reading Ruth Goodman’s How to be a Victorian (Norton 2013) and I found it so informative and delightful I thought I’d mention it here. Like some other period histories, Goodman’s book relies on periodicals, etiquette manuals, and advertisements to render a portrait of daily life in the British c19, but unlike other such works, she actually tries most of the methods herself. It is interesting to hear about the methods of bathing in a typical Victorian household. I’ve often seen the ceramic pitcher and bowl on dressing tables in paintings and illustrations from the period and wondered just how they were used. But it is quite another thing to hear a twenty-first century woman bathing herself according to the methods—say, for example, using no soap or water but merely scubbing the entire body with a linen cloth— and hearing her relate that her skin glowed thereafter and that it somehow kept body odor at bay. I loved hearing that her experiment in Victorian haircare methods—no shampooing, only a weekly rinse and otherwise regular brushing with natural bristles—was so successful that she’s adopted it as her own regimen. Or again, we’ve all heard over and over the feminist canard that corsets were a tool of oppression and so tight as to render women’s lives a dull dream of constant pain. But here this Goodman tries one out—effectively shrinking her waist up to 4 inches at one point—and saying that she’s rarely felt more comfortable: that it turns out using one’s abs to hold oneself up all day (or slouching when they’re exhausted, as most of us moderns do) is the real pain, and having a little external support not only corrects one’s posture, but makes one feel more elegant almost immediately. She says she felt like she could sit and read all day when corseted: what a life! Granted, she does say that it was itchy, but that isn’t the usual complaint. Also—something I didn’t know and had never conceived of—men used to wear them too. Apparently, corseting was not a gendered activity, especially in the early part of the century. Anyway, it’s all wonderful, even when it is depressing. One hates hearing about the long work days for little pay, about the age at which boys were sent off to factory or farm work (often 6 years old) to begin 12 hour days that would not cease for them till death or injury, but even so, the pride they took even at that age in turning over their wages to their mothers is touching somehow, despite everything else. A sympathetic, well-researched, and enjoyable project, this.